How often should I pressure wash my home? Can I pressure wash my own home? - The Pressure Kru, Inc.
Blog How often should I pressure wash my home? Can I pressure wash my own home? SPRING HAS SPRUNG – is YOUR HOUSE READY? This newsletter will cover the common homeowner questions that I receive while on jobs in Jacksonville, Florida community. The single most asked questions by our customers is….How often should I pressure wash my home? It is pretty easy to tell when your home is ready for a cleaning, simply walk around your home and look up at the vinyl soffits around the perimeter of your roof overhang. 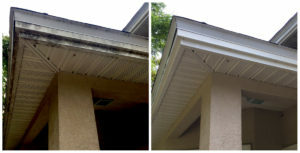 Your homes vinyl soffits are typically white in color so they easily show dirt, mold, spider web nests, etc… If they do not look as new as the day you moved into your home then it’s time for a cleaning. To further reinforce why you should have your home professional soft washed is to look in your home owners operations & maintenance manuals. Home builders now provide literature recommending that the Owner softwash the home exterior and roof once per year! If you can run your finger on the exterior of your home and notice a substantial amount of dirt on your finger, then it’s probably time to contact a professional to provide you with pressure washing services. Plan to clean your home once a year. Spring is the best time to review the exterior substrates of your home and determine if spring cleaning is needed. That’s the beauty of pressure/ softwashing: with a few simple steps, your home can be transformed from dirty to immaculate! Spit wood members on your deck or burr the wood. Blow out or puncture exterior door & window caulk joints, etc……. Pressure washing a driveway with a wand will take you about 4 to 6 hours, This is a lot of work, which can easily be accomplished by a professional in under an hour. A lot of people get the satisfaction from doing things themselves and I get it, but another important factor is having the right tools for the job at hand. A surface cleaner, which every professional pressure washing company has on hand, matched up with the proper meg tips for your machines GPM flow will provide a uniform better quality cleaning and reduce cleaning time down to about 30 minutes. A professional also knows the correct chemical/cleaning solutions to use to ensure the end result is as clean as it can possibly get. Pressure washing without chemicals is like applying one coat of paint to the walls of your home. It will be uneven and splotchy. The chemicals provide a longer lasting clean. The average sized home (+/-2000 square feet) with a driveway and back patio slab can be cleaned by a professional in about 2 to 3 hours for as little as $200 to $300. With Football and BBQ season soon approaching, give The Pressure Kru, Inc. a call and let us give your home that annual spring cleaning it deserves!